Investors are feeling happy today. Pharrell Williams-style happy! 1. Perky stocks: There's a feeling of confidence in the markets right now. 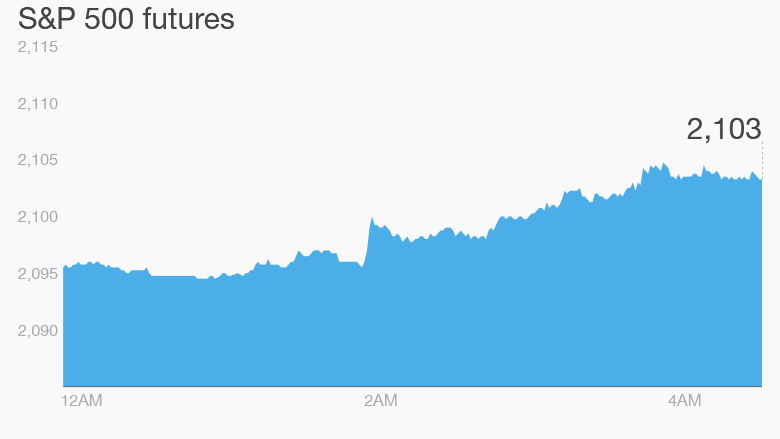 U.S. stock futures are pushing up, European markets are all rising in early trade and many Asian markets closed the day with big gains. The main Chinese indexes all surged by about 2% to 4% Tuesday, recovering from a sharp drop Monday. The latest reading from CNNMoney's Fear & Greed Index shows investors are feeling increasingly greedy. 2. Endless earnings: We're in the middle of earnings season and many big companies are reporting Tuesday. Harley-Davidson (HOG), Lockheed Martin (LMT), Under Armour (UA), Verizon (VZ) and Kimberly-Clark (KMB) are reporting ahead of the open. Chipotle (CMG), Yahoo (YHOO), and YUM Brands (YUM) will report after the close. British-based tech firm ARM Holdings (ARMH) reported a double-digit surge in revenue and earnings, which impressed investors. Shares are up about 6% premarket. Meanwhile, shares in Credit Suisse (CS) dipped by about 3% in Europe. The bank's quarterly numbers were solid but investors are still not entirely happy with its financial strength. A key metric tracking the bank's capital levels has deteriorated. "The issue today will be capital for a bank where concerns linger," said Jefferies analyst Omar Fall. 3. Greece is the word: While European markets are making gains Tuesday, concerns about Greece remain in the back of everyone's minds. On Monday, the Greek government asked all public sector organizations to hand over their cash reserves, just in case it needs to borrow the money. This is the latest indication that the government is running short of money to service its debts and pay wages and pensions. "Several very large payments are due at the end of April and in May, which are making people nervous about the prospect of default," said Angus Campbell, senior analyst at FxPro. If Greece defaults on its debt, the country may be forced to start printing its own money and abandon the eurozone, which would cause a wave of uncertainty. The euro was 0.7% weaker against the dollar. 4. Monday market recap: Wall Street posted a solid performance Monday. The Dow Jones industrial average rose by 209 points, the S&P 500 edged up by 0.9% and the Nasdaq gained 1.3%. That followed a sharp drop Friday.